We try to ignore the agony of betrayal, hoping it will go away. 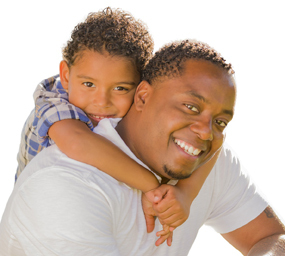 Paradoxically, says Travis Vining, author of Transforming Darkness to Light for Giving, it’s not in spite of our difficulties that we find freedom, but because of them. 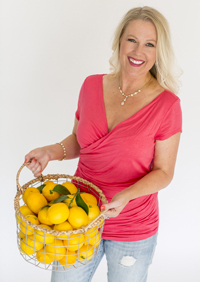 Travis Vining will be presenting a Lovefraud Continuing Education webinar called, The Miracle in the Madness – the pathway to healing from destructive relationships. 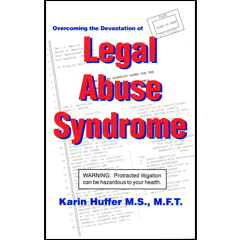 He will explain how to gently, courageously, overcome the pain of betrayal by a sociopath. 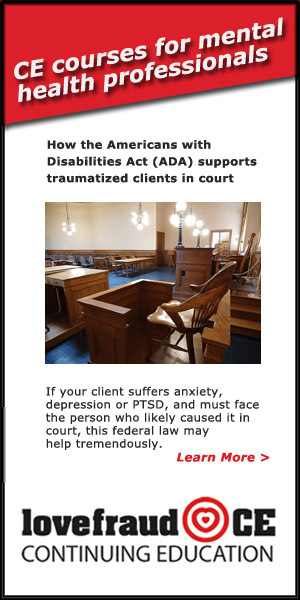 Therapists: If your client suffers anxiety, depression or PTSD, and must face the person who likely caused it in court, the federal Americans with Disabilities Act (ADA) may help tremendously. 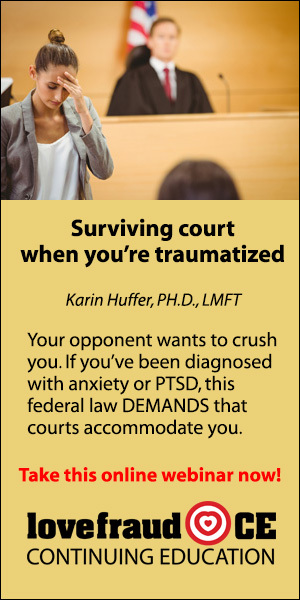 Learn how to refer your client to court administration for accommodations that may improve his or her executive functionality during legal proceedings. 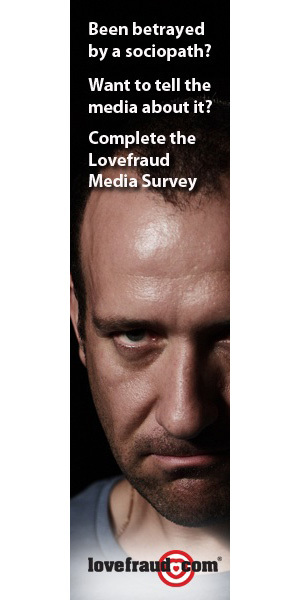 Tina Swithin will present a Lovefraud CE webinar on Aug. 9. 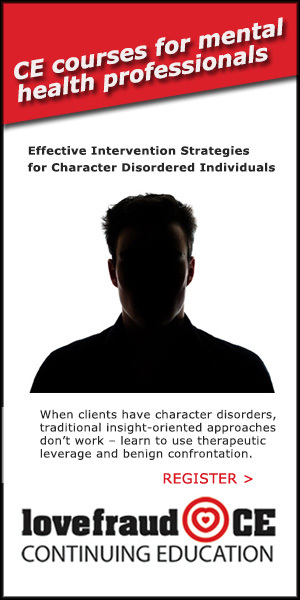 If you’re a therapist, what did you learn about people with personality disorders? 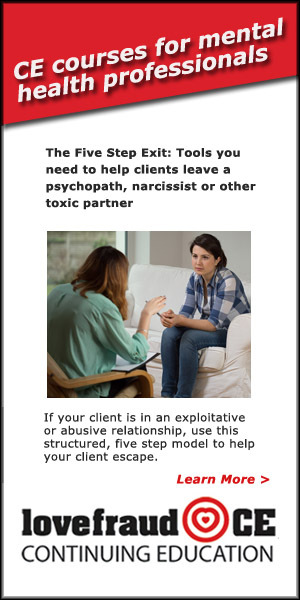 When you were in training, did any instructor ever warn you that clients especially clients in couples therapy would walk into your office with a hidden agenda? 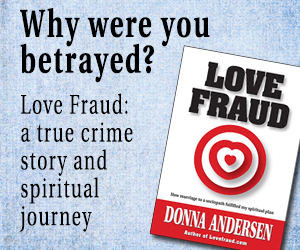 FREE e-book with the purchase of any Lovefraud CE course! 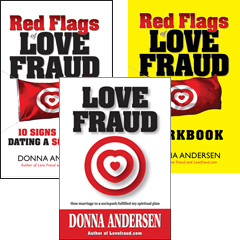 With any purchase of a Lovefraud CE course, you get one of Donna Andersen’s ebooks, sold for $9.99 on Amazon, absolutely FREE! This offer applies to on-demand self-study courses, and to upcoming webinars. See details below. 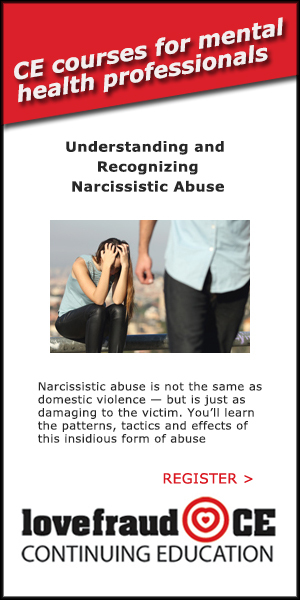 If you need to understand personality disorders right now, five Lovefraud CE courses are now available on demand. Just sign up, and you can view them immediately. 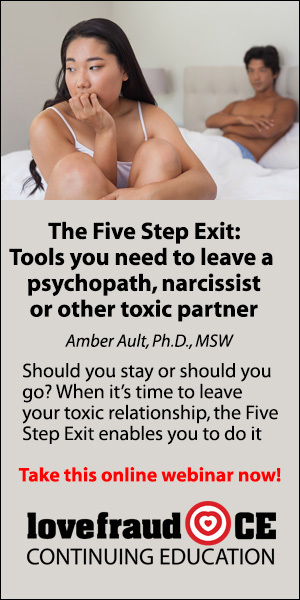 Perhaps you now know that you’re involved with a sociopath or other disordered individual. You’ve been Googling “sociopath” “psychopath” and “narcissist” like crazy, and found that a lot of what you read matches the behavior that you see. So now what? What do you do? 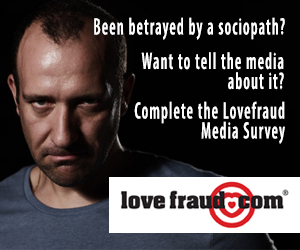 That’s what I will explain in Part 3 of the Lovefraud Recovery Series. 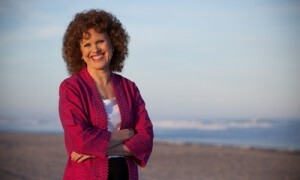 The webinar takes place Thursday, June 30, at 8 pm Eastern time. Do you fight or cut your losses and run? One of the worst things about sociopathy is that it is highly genetic. That means everyone who has children with a sociopath must face a hard truth: Their children are also at risk of becoming sociopaths. 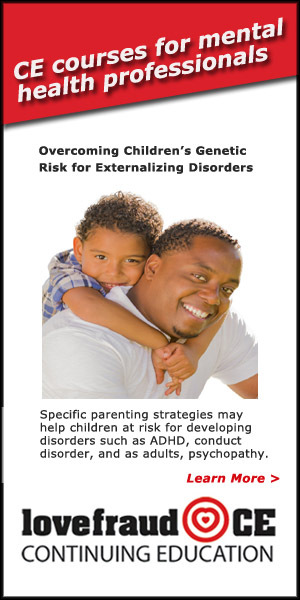 But genetics are not carved in stone, and just because children are at risk does not mean they are doomed to develop personality disorders. 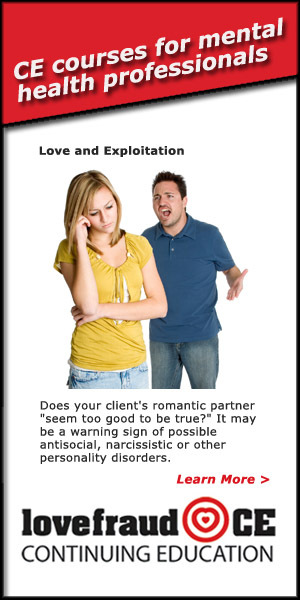 If you’ve discovered that your partner is an exploiter, and you don’t know what to think and what to do well, I totally understand. I’ve been there.